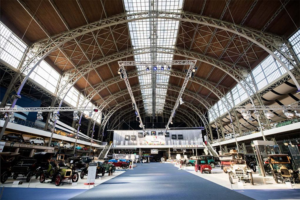 In May we visited Makerstown in Brussels, a one-day event where inventors, makers, schools, businesses and policymakers join together to discuss what the town of the future will look like. Makerstown gives a space for makers to display innovative products, which range from 3D printed robots to on-the-spot blood testing kits, offers platform for policymakers and startups to debate how makers can be supported, and provides an educational opportunity for children – inspiring the next generation of makers. Here, we caught up with maker Paul Myers, co-founder of Farm Urban, a Liverpool-based social enterprise which researches sustainable and efficient methods of growing food, and develops tools to make these methods available to everybody. At Makerstown, Farm Urban exhibited the Produce Pod, an open source aquaponic system for home and educational use. The Produce Pod works by housing fish which produce waste – this waste is digested by friendly bacteria and transformed into an organic fertiliser, which is used to grow vegetables. This mini ecosystem allows the user to grow food anywhere, in the most efficient way possible. The Produce Pod also has the added benefit of providing an educational tool. Paul says it is a “really great way to introduce kids to healthy food by having a living breathing system in the classroom” and that the Produce Pod also “provides STEM education that is very effective”. The educational aspect of the Produce Pod attracted attention from the many teachers present at Makerstown. 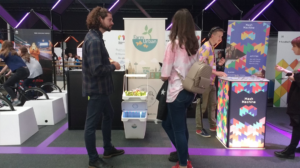 Paul suggest that while initially – many people are drawn to the Produce Pod, because it is a living thing, and it stands out against more “techy” innovations – their interest redoubles when they hear about the educational prospects. It is clear that for educators, the Produce Pod is a smart choice, it can facilitate the growth of a whole ecosystem – from fish to bacteria to vegetables, but it can also nurture a range of skills, from STEM and entrepreneurship to teamwork and communication. Speaking to Paul has revealed the numerous benefits of attending an expo like Makerstown. 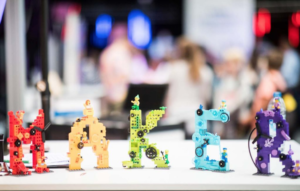 Aside from being a venue for makers to showcase their innovations, gain potential customers, and influence policy makers, Makerstown also offers a chance for makers to meet each other, and to hear from specialists in their fields. Paul said that “there has been loads of really interesting makers, and quite a broad spread, there’s robotics, environment, health, internet of things, so a real mix of innovators and start ups, so it’s been really great to connect with all of them”, and that the various talks taking place throughout the event “have been interesting to listen to, as a lot of the topics focus on the future of education, and how you bring new technology into the classroom”. Visiting Makerstown was like stepping into a future that is not only incredibly exciting, but entirely realisable. The success of enterprises such as Farm Urban is a testament to innovative design and the power of innovation to act as a force for good, but also the ability of small to medium, and social enterprises not only find their place, but to thrive in a modern economy.